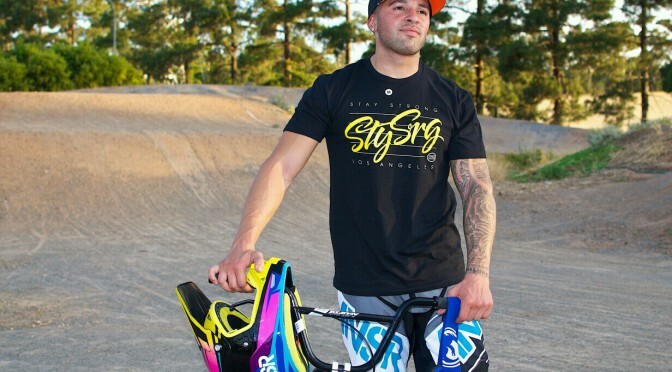 Five-time BMX World Champion and British Cycling Hall of Famer, Dale Holmes, has launched Dale Holmes Racing, LLC DBA Chase/Stay Strong BMX Race Team. The team will travel to all USA BMX pro series events, UCI BMX World Cup Races, select Internationals, and The UCI BMX World Championships in Holland. The team will be owned and managed by Dale Holmes and will include 11-time National Champion and 2008 Olympian, Cristian Becerine, up-and-coming Australian 2013 Series Champion, Anthony Dean (pictured above), as well as US Amateur (17-18 Expert), Bryce Betts. Dale Holmes Racing will also offer personalized BMX coaching and training for athletes, a nationwide clinic tour at USA BMX sanctioned tracks, and a summer camp partnership with the Toby Wells Foundation & Mission Valley YMCA facilities to offer, “BMX Pro for a Week,” an interactive school nutrition and onsite riding program, “Ride to End Obesity,” at Poway Unified School District sponsored by both Walmart and Barona. Secured team sponsors include: Chase Bicycles, Stephen Murray Stay Strong, Walmart, Barona Resort & Casino, Elevn, Insight, Kingstar, Excess, Vee Tire Company, Answer Racing, Shimano, ODI, KMC, Kicker & Stealth.